Do you love Libby? So do we! 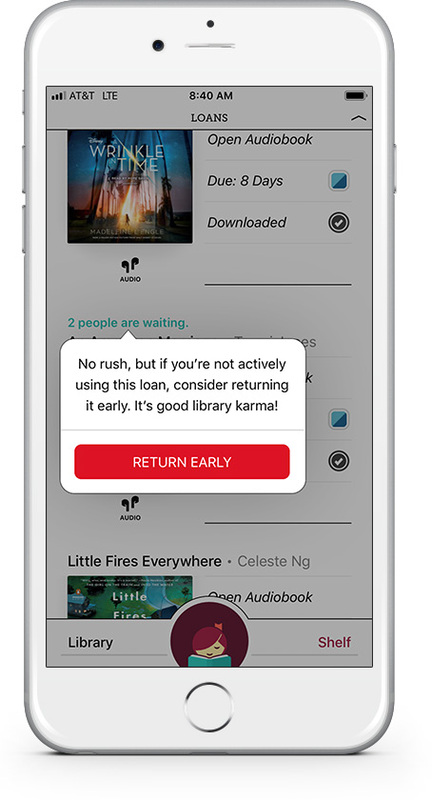 Libby is an easier way to read eBooks and listen to downloadable audiobooks from OverDrive. Updated Loans display: Find a new reading progress bar and exact due dates in the refreshed Loans screen. Tap on the due date for each book to view options to return early, renew, or go to the details page. Improved wait time display: View your estimated wait time for a hold by tapping the new calendar icon on your Holds shelf. (You'll also see this if you're looking at the OverDrive website.) Note that all wait times are estimates and your actual wait time may change based on various factors, like early return and hold "pickup" time. New Shelf summary: Visit your Shelf to find a quick summary of your current read, titles available to renew, recent returns, and more. Improvements for multiple library cards: Do you also have library cards for Seattle Public and other nearby library systems? In Libby, you can now borrow and place holds on the same title from more than one library that you have a card for. Kindle updates: Setting Kindle as your reading preference is even easier than before. View a summary of this and other recent releases directly in the Libby menu (Menu > Libby > What’s New in Libby?). You can see a summary of this and other recent releases directly in the Libby menu (Menu > Libby > What’s New in Libby? ).